Immediately after opening the hatchback of his Suzuki Wagon R, Ted and I foraged through the tangled mess of left behind gear, searching for a dry change of clothes. Among the scattered things, I had an extra winter jacket and a Uniqlo heat-tech turtleneck base layer, while Ted had a couple of pairs of low-top walking shoes. We sat in the spacious bus stop shelter and slowly stripped off our wet layers. It felt good to get some dry fabric on my upper torso. Despite wading though the river, my snow pants did an impeccable job soaking up the water and my hiking pants were only slightly damp. Rolling up my pant legs, I gasped at the state of my lower extremities. 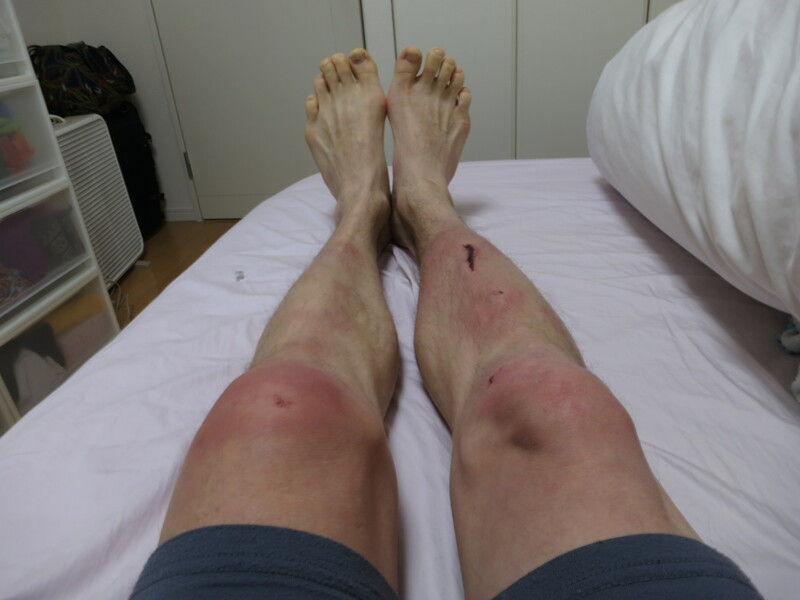 My left knee was red and had started to swell, while a large gash on my right shin sent shivers down Ted’s spine. “At least the bleeding has stopped,” I added, trying to make light of what could have been a much more serious situation. I found a slightly damp pair of socks in the bottom of my pack and wrapped them around my wrinkled toes. My snow boots had withstood the test and kept the blood circulation flowing to my metatarsals. My companion, ever the sucker for punishment, put his bare feet directly into his shoes, figuring it would be warmer than keeping his soaked socks on. Ted put the car into gear while we edged our way down the snow-covered byway. We were in a lightweight 660cc three-cylinder engine vehicle without snow tires and we needed sustenance and warm shelter without delay. I learned to keep my mouth shut after that. We were in the middle of nowhere, it was after 1 in the morning, and there were no witnesses should the pigs pull a Rodney King on us. Ted was really starting to feel physically uncomfortable, as he had lost all feeling in his toes from standing there in sock-less shoes all this time. “Do you have any injuries?” asked the cop directly in front of me. I replied in the negative, knowing that if they discovered the state of my legs they would force me into an ambulance and we would likely succumb to hypothermia en route. “Why is your nose bloody then?”, inquired the most persistent of the three. I had a glorified Sherlock Holmes on my hands here. I covered as best I could: “oh, I must’ve hit it on a tree branch.” After taking a photo of my facial cuts, I could sense the questioning was coming to a close by the sermon-esque nature of the conversation. We were being scolded for our late start and our lack of registering our climbing intentions with the authorities. We apologized profusely until we sensed the change in tone. The friendliest even offered his condolences: “It must’ve been cold up there.” We wrapped up by asking the location of the nearest convenience store, which turned out to be right around the corner. In hindsight we should have headed there first and told the cops to do their questioning there. At least we could’ve eaten a warm meal and Ted could have gotten socks for his feet! We hit the 7-11 and went to town. The poor store clerk must’ve thought we were certified lunatics for the sheer amount of trips we took to the register. I bought instant noodles first, and while they were brewing did the rest of my shopping: a new pair of gloves, new socks, a salmon and seaweed rice ball, an isotonic sports drink, and two liters of water. Ted did the complete opposite, buying clothes first in lieu of nutrients. We stood at the counter for over half an hour, putting on our new digs and filling our tummies with warm noodles. The final purchase was a newspaper that we could use to start drying our shoes. We hit the road again and coasted into Kyoto city shortly after 3am. Ted turned on the gas heater and electic blanket, filled up the bath, and produced two cups of piping hot tea. We sat on the warm floor, recapping what went right and what went wrong on our trip. It’s true we got in some hairy situations because of our careless choices, but ultimately saved ourselves with some key decisions when they mattered most. 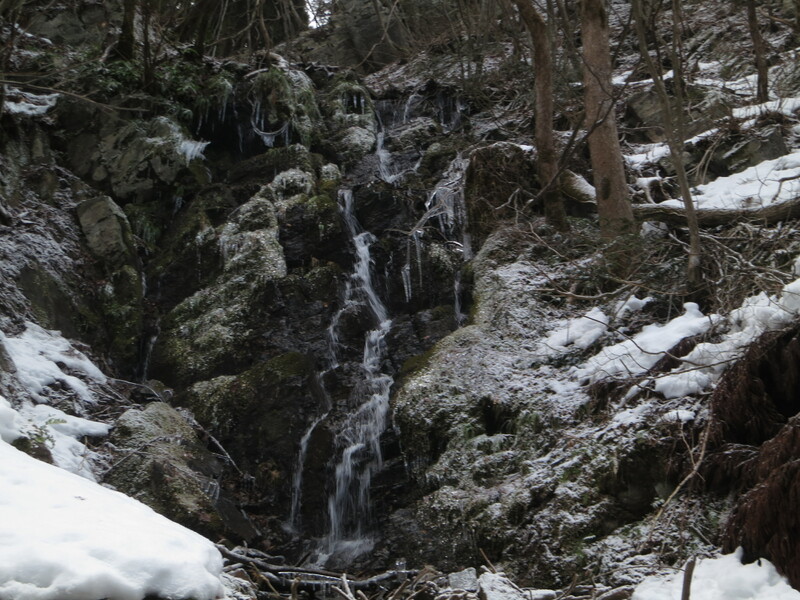 Alas, we were saved by the very mechanism that has destroyed the beauty of Japan’s mountains. So the next time you become hopelessly lost in the mountains, instead of following a stream, you might be better off following the cedars. Just as I was discussing our situation with Ted, I received a final message from Mike. “No help coming. Build a snow cave or keep moving.” Ted and I wandered back and forth on the ridge, but the clouds had moved back in, limiting our visibility. 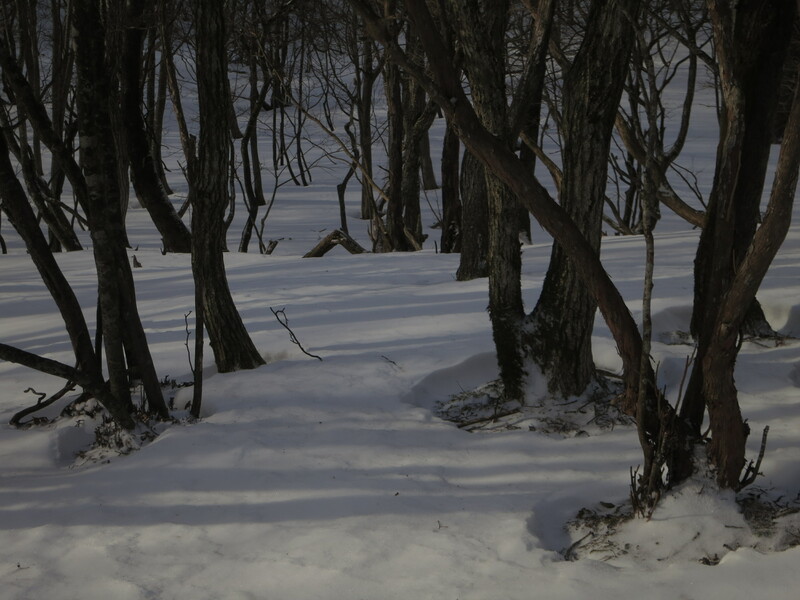 We’d follow the trail for a short time before losing it in the whiteout conditions. We had been on the move for nearly 7 hours without taking a break. Soon the adrenaline would start to wear off and fatigue would overtake us. In the dark, sub-arctic conditions there was no awareness of time. In fact, I felt no emotion at all: no sadness, no panic, and most importantly, no pain. It was as if the amygdala cells in my brain had taken a holiday to Bermuda. I still knew who I was and had some indication of where I was (i.e. 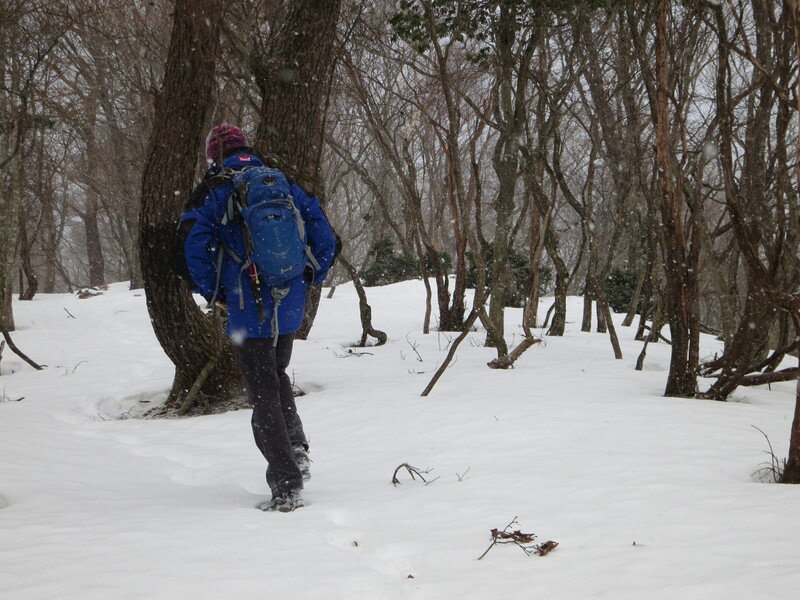 lost on a mountain in Shiga), but felt generally at peace with myself. Perhaps it was because I was putting off all thoughts of dying up here, since I knew it would require too much energy. Ted and I reached an area of cedar trees. Some had been cut, while others were wrapped in large swaths of blue masking tape. 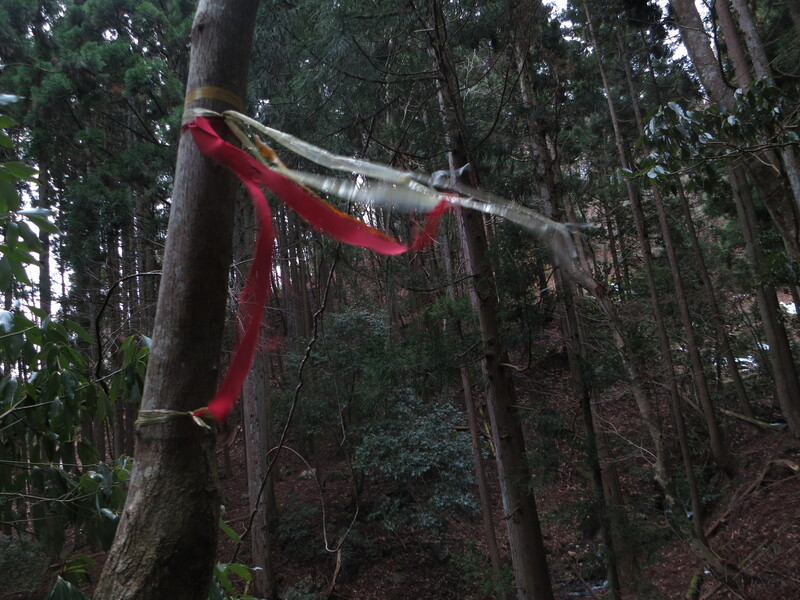 I wasn’t sure if the tape was used to tell the loggers which trees to cut or which trees to spare. Regardless, we knew that someone had been up here, and they weren’t hikers. My gut instinct told me that there must be a forest road nearby, but it would require us leaving the ridge a third time. We both knew what happened the first two times we veered off the trail and neither of us were too thrilled at the prospects of repeating that ill-informed decision. While discussing the pros and cons of following these cut trees, I spotted something in the valley. “Quick Ted, turn off your headlamp.” Through the trees, we could see lights directly below us. There were houses there, and they felt close. The clouds had lifted just long enough to give us a much-needed confidence boost. I once again took the lead, chasing the cut cedars down the valley until we reached yet another watershed. This one felt different, however. It lacked the steepness and depth of the two previous streams we had followed. Plus, it was lined with cedar trees on both sides. Our biggest challenge was clambering through the thick maze of downed trees. You see, the trees that had been cut in this area were left to die a slow death. This is common practice in Japan, when loggers come in to thin the forest. Cedar lumber is hardly a commodity item nowadays with Japan’s heavy reliance on concrete. Logging is not necessary except for creating work for the logging companies. More pork-barrel politics at work, but perhaps this deforestation would actually lead to our survival. Ted took the slow and steady approach, as I opted to thrash my way through the maze. At one point I slipped on a snow-covered trunk and bashed my ribs into a rather large log. I was already bruised and bloody from head to toe so figured a few added scratches for good measure could never hurt. The stream started flattening out and was not growing in size. To our right, on the ridge about 1o meters above us, appeared to be some sort of trail. Ted climbed up to investigate while I continued flopping about like a fish out of water. I heard Ted shout something. He was just out of ear range but he sounded excited. I started climbing the steep bank to meet him. “I’ve found a trail”, exclaimed my partner. He sounded as if he had just discovered Captain Kidd’s buried loot. Reaching Ted, I too noticed the deep erosion marks in the gully and the lack of undergrowth. This was definitely a trail, and downward we sped towards what we hoped was civilization. The path paralleled the stream and it was much easier on the feet than the log maze of the frozen waters. After several minutes of rapid sailing we meet a paved forest road lined by a 3-meter high chain-linked fence. It was the same fence we had seen earlier in the hike! 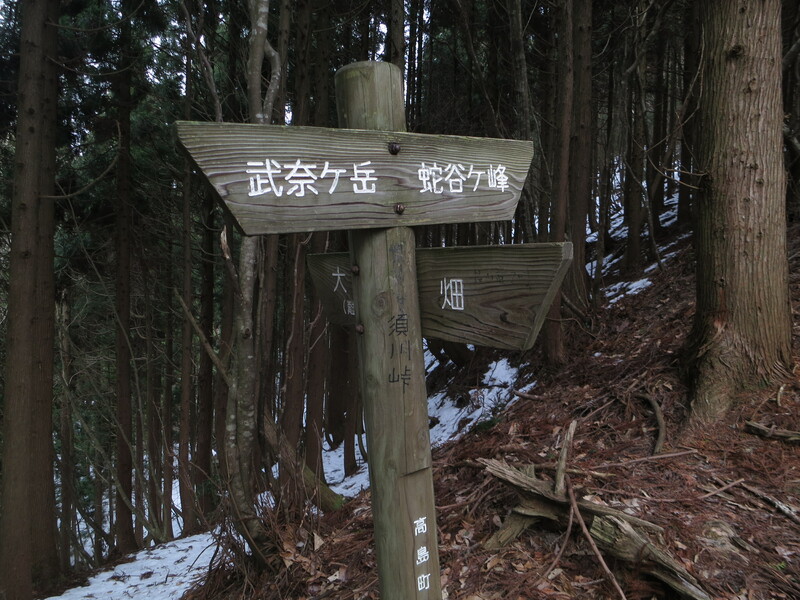 A signpost pointed the way toward Yokotani-touge. I gave Ted a big hug and felt my first sense of relief for the first time that night. Ted opened the gate in the fence while I selfishly pushed ahead. It didn’t dawn on me that he might have trouble fastening the bolt back in place. He gave up after several minutes and joined me as the trail meandered through snow-covered rice fields and past darkened thatched houses until we reached a hard-surfaced road. There was water flowing down the road as if there was a flash flood. This is intentionally done to keep snow and ice from sticking to the roads, which would make it impossible to drive on. Both of us continued descending through the sleepy hamlet until reaching the bus stop and our awaiting car. Yep, we certainly had done that loop hike we were envisioning earlier in the day. It just didn’t turn out as smoothly as we had imagined. Even though we had reached the car, our troubles were far from over. I sat at the bottom of the ravine in a daze. Blood trickled from my nose and my left hand sported bright blotches of red as well. The only positives to falling were that one, I landed exactly where my flashlight had come to a halt, and two, I hadn’t slid into the river. 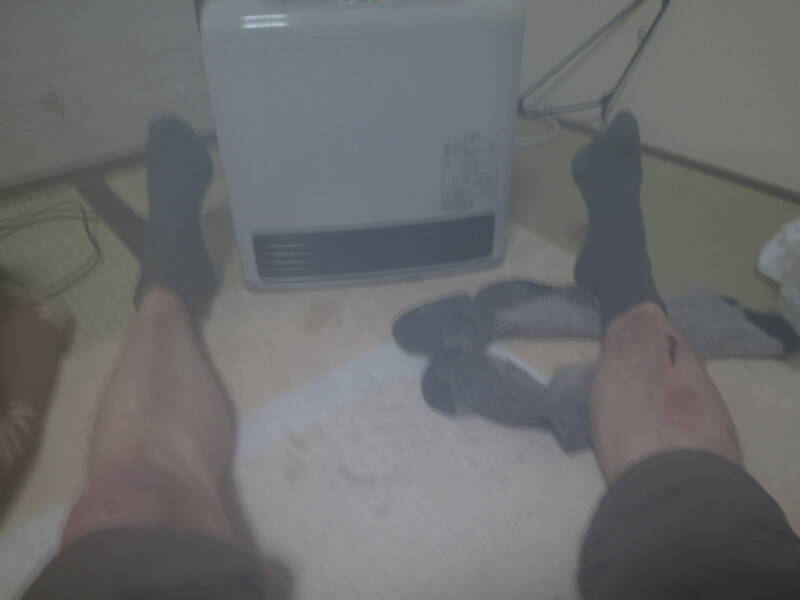 Rising to my feet, I noticed that nothing appeared to be broken and that the blood on my left hand was coming from surface level lacerations suffered in the slide. Even though I desperately needed my gloves, I couldn’t see them anywhere in sight, so I would sinp,y have to do without for the time being. Still dazed from the fall, I immediately started trying to climb back up to Ted. I headed perpendicular to the area I had slid down and climbed about 5 meters up until arriving at the base of an ice-covered rock wall. I could see the ridge only 2 meters above, but it would require a bit of tricky hand and footwork to reach it. In dry conditions in daylight it would have been a non-issue but I was gambling with my life. Even one small mistake here, and I’d take an even nastier tumble that I’d just experienced. Wisely, I looked for another option. Spying a fallen tree that spanned the entire length of the ravine, I inched my way over towards it before losing my grip and sliding once again on the rocks. Fortunately I only slid two meters bef0re coming to a halt. A few steps further and downward I slid again. If I didn’t find a way out of this ravine it would be game over. Looking a short distance down the ravine, I spied a tree clinging tightly to the rock face. I had no idea if it would hold my weight but I had no other options. All I needed were two strong footholds. Bracing my left leg against the ledge I was standing on, I stretched my right foot out and found a foothold. Counting to 3, I forced all of my weight on my right foot and let my momentum do the rest. I grabbed the tree trunk with my bare left hand, swinging up until both feet hit snow. Next, I simply extended my right hand upwards until it meet the next tree branch. By now I had already lost feeling in both hands but was pushed on by the unseen force of survival. I climbed in silence, reaching the base of Ted’s feet a few minutes later. Ted had lost a lot of body heat waiting for me to emerge from the abyss, so he was anxious to get a move on. After a quick examination of my facial injuries, Ted continued climbing towards the ridge while I attended to my hands. I reached in my pack and pulled out my down jacket. Taking off my wet outer later, I put the down on over my fleece and immediately zipped my outer layer on top. Pulling out two kairo heating pads from my pack, I grasped one in each hand while sliding my fists inside the sleeves of my down jacket, and winched the flaps of my rain jacket tightly to create a vacuum. Even though I’d have no more use of my fingers at least they were out of the elements. Ted and I continued our slow climb towards higher ground. We’d grab onto a tree, hoist ourselves up, and collapse to catch our breath after every vertical meter of height gained. The snow continued to fall in heavy sheets, adding to our woes. Because my hands were essentially immobile, I wrapped my forearms around the tree branches for extra grip in my best imitation of an ancestral mountain gorilla. Step by step, meter by meter, the two of advanced higher and higher above the valley floor, eventually topping out on a ridge. “Look, there are red tape marks here,” blurted Ted. We had found our ridge trail for the third time that fateful day. Nearby we spotted a concrete survey marker with the number 74 written on it. I fished out the cell phone and immediately called my friend Mike in Kyoto, who was expecting us for dinner. “We’re lost on the mountain,” I explained, “call the police”. After hanging up, I noticed that the clock read 9pm. Time flies when you’re fighting for your life. Mike discerned some information on our whereabouts through a series of e-mail messages, while Ted and I started gathering kindling. Even though there was a blizzard, making a fire was our best chance of surviving, since we were both soaked from sweat and from our mindless dip in the river. Rummaging through our supplies, I tossed the guidebook over to Ted so he could start tearing it apart. “Do you mind where I start tearing from,” questioned my companion, mindful even in the most dire of times. “Best start from the back,” I returned, knowing that if we had to burn the entire thing at least I’d have the guidebook cover to have as a keepsake. Ted tried in vain to get the fire going. The waterproof matches were fine. The worn out striker was the problem. Add a lighter to my growing list of essentials for future hiking trips, if we make it out of this alive. After several minutes we gave up completely, deciding once and for all that we would need to find a way off that mountain. Suddenly, as if on cue, both of us saw a series of glowing lights on the adjacent ridge. To me, it looked like a subdivisi0n of rustic retreats built by rich executives in Osaka. To Ted, they appeared as a series of headlights. Perhaps the cops had gotten word and had sent their four-wheel drive vehicles up the forest roads. “Tasukete“, screamed Ted, as I blew loudly into my emergency whistle that I had somehow slipped around my neck during this ordeal. Our calls for help went unanswered, as we both came to the realization that we were victim to a wicked optical illusion. Yes, those were lights that we were seeing, but they were down in Takashima city on the shores of Lake Biwa, nearly 30 kilometers away. At least we knew which direction was east now, since my compass had completely cracked and froze in the tumble. A short time later, my phone rang. It was the cops, informing me that I needed to call 119 if we really needed rescue. Hanging up the phone, I put out the distress call. The operator was expecting my call, and asked me for my GPS location. Ted’s smart phone had died hours ago, so we had no access to coordinates. “Survey marker #74”, I answered, knowing that the information would be as useful to her as telling her I was on planet earth. The operator informed me that the earliest they could send someone was daybreak, and that we should stay in cell phone range and wait until the morning for rescue. Thanking her, I hung up the phone and broke the news to Ted. Shortly after following the small stream, Ted and I came across some red tape affixed to a tree. 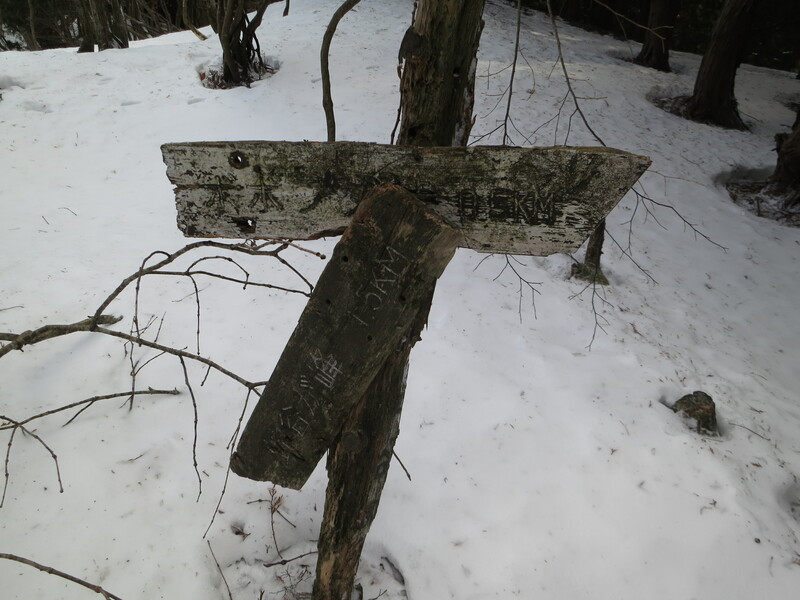 This was clearly a trail marker, but where the path leaded none of us knew. Blindly, we stuck by the water’s edge instead of chasing after the marked path. My initial thought was that the trail must be for loggers since we were moving through an area of planted cedar trees, but in hindsight perhaps this would lead us to the trail we had hoped to find. The further downstream we traversed, the rougher the terrain. The watershed grew in size as it met neighboring tributaries, with the walls closing in on us. To avoid the waterfalls, both of us climbed high above the river banks, looking for an outlet that would lead us to flatter and easier terrain. Peering down the banks of the river from above, there was no apparent end to the folds of ridges that dropped abruptly to the rocky depths of the canyon. We changed tack, opting to leave the water source and climb back up towards the ridge we had inadvertently veered from earlier. I once again took the lead, burrowing through the untracked snow for the better part of an hour before collapsing in a winded heap on the spine of the mountain range. The deciduous trees were clearly adorned with small snippets of red tape. Heading east, the trail dropped steeply down to a stream. “This is probably the same stream we just came from”, I remarked. Too dejected to investigate further, we backtracked and continued to the west. Ted’s pace continued to slow as I coasted along with renewed vigor. We were definitely on the right track, but how far would we end up venturing before finding a path down to a village? 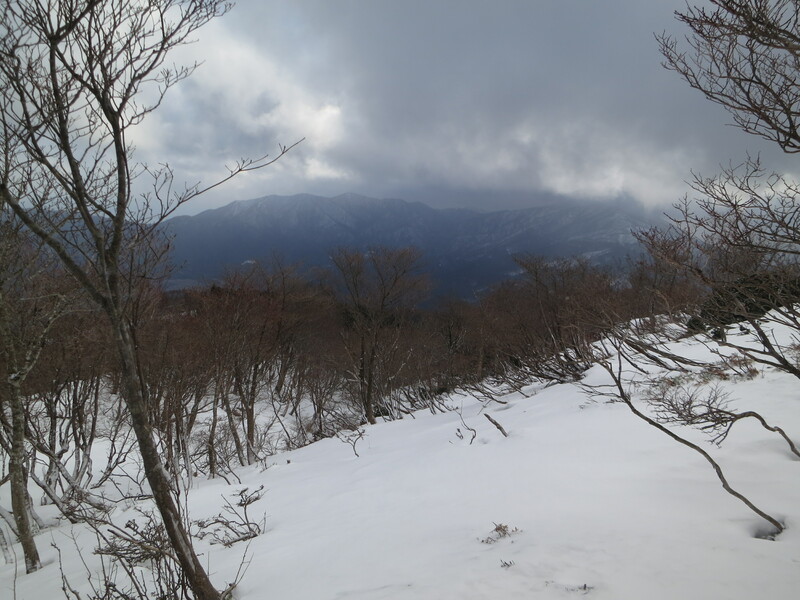 Were we even on the main ridge between Jyatani and Buna? These thoughts haunted our every move, but neither of us bothered to call a “time out” to assess our position and ponder a logical move. For one, the cloud had rolled back in and the snow began to fall. That storm front to the north was making a sales call, and neither of us wanted to wait around for the sales pitch. Staying along the ridge proved to be a good idea, as a large metal signboard soon came into view. Rushing ahead, the smile on my face soon turned south as the entire contents were completely overtaken by rust. It was a map of the area, showing our current position as well as the location of neighboring forest roads. 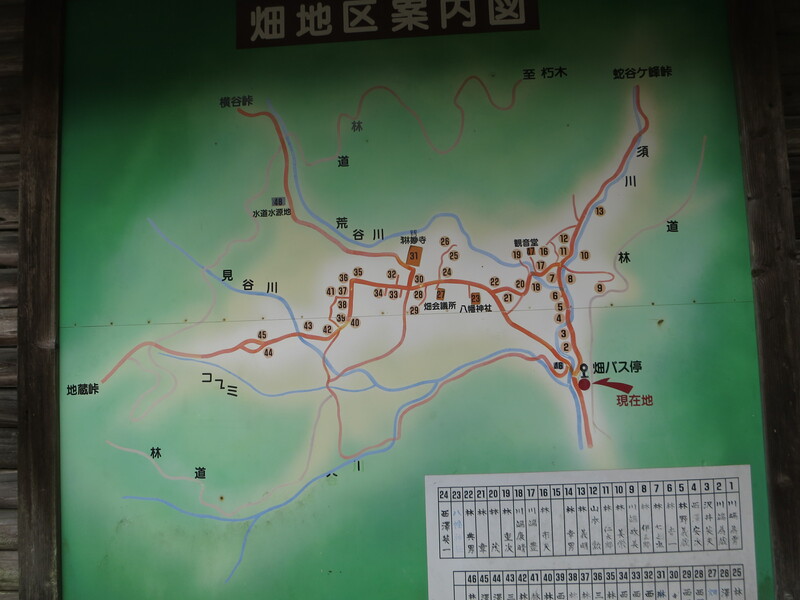 For some strange reason, the only legible part of the map was a large red dot with the chinese characters 現在地, which basically translates as You Are Here in cartographer terms. Judging by the amount of cedar trees in this location, we both realized that there must be a forest road somewhere close to here. How else did they hoist this giant signboard up here unless they dropped it by helicopter? Peering off the northern face of the ridge, I could see nothing but a dark stand of cedar in the rapidly fading light of the day. If we dropped off here, we’d lose daylight much faster than continuing west. Just past the sign, the ridge suddenly turned north, heading for who knows where. Using the compass for guidance, both of us agreed that we should continue pushing west, regardless of the terrain because we knew that was the direction we needed to go. Here we were, leaving the ridge for a second time and straight into another gully. Though starting off quite gentle, the trickle gradually grew in size. Foolishly, we stuck as close to the water’s edge as we could, and with each advancing descent the rapids became larger. Additionally, the daylight continued to wane and we soon found ourselves reaching for our lights. Luckily, Ted had his headlamp, but I was stuck with my Buglit flashlight, which I ended up dropping more times than I can remember. Rock hopping soon proved fruitless, and at one point Ted and I stood on top of a boulder at the top of a small waterfall. There were steep rock faces on both sides of the stream, and no where to go except into the water. Ted took the plunge first, wincing from the chilly water that soaked his lower torso. I dropped my pack, taking everything out of my pockets and shoving them in the uppermost compartment of my pack. I took a deep breath and stepped off the ledge. Water rose past my waist and into my pants as I splashed about. Stupid, stupid, stupid. Now both of us were wet, and the only option now was to keep moving, as neither of us had a change of clothes. Both of us also knew that getting wet again was not an option. We climbed on the left bank of the river, up and over an adjacent bend and dropped back down to the river on the other side. On the descent I leaned too far forward on my trekking pole, watching the metal tubes bend as if done by Superman himself. When I tried to straighten it out, the pole snapped completely in half. Not only was I up the creek without a paddle, but I had nothing to stabilize myself in case I should slip. Fortunately, Ted had an extra pole that he generously and unselfishly lent to me. The river soon met another waterfall. This one sounded much larger than the previous ones, and in the sheer black of the night there would be no telling how many meters it dropped until it were too late. 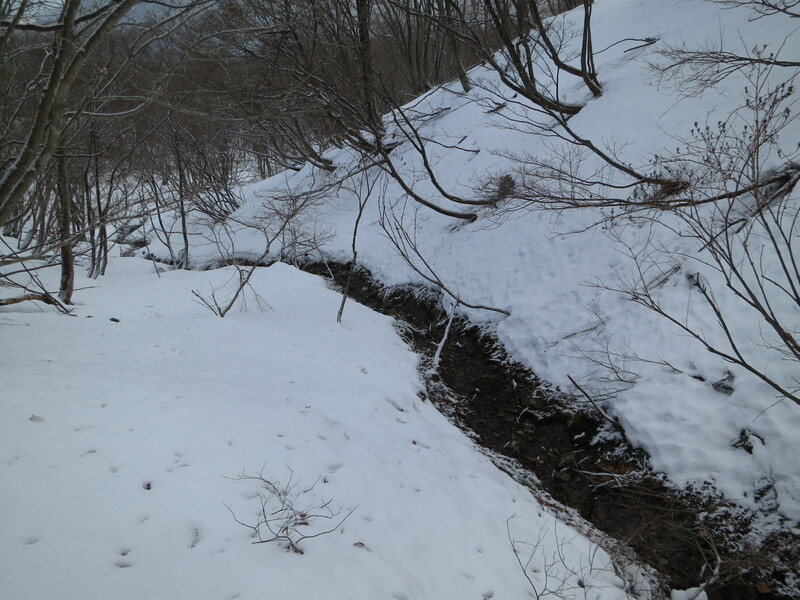 Again, we skirted the steep banks on the left side of the stream, reaching a point were a small ravine came in from the left. 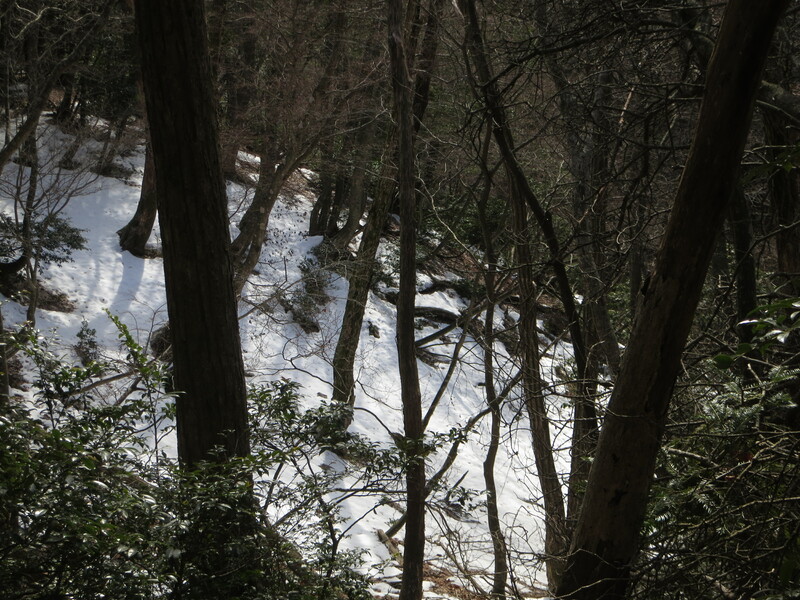 If we continued, it would be necessary to cross this ravine or bypass it by climbing higher up the hill. As I peered down into the abyss, I once again dropped my flashlight, sending it tumbling down about 10 meters directly below me. Now I had no choice but to go down there to retrieve it. The were very few footholds and nothing to grab onto that would aid in the abseil. Rope would have been a really good thing to have in the pack about now, I lamented. Anyway, I took one step to my left and immediately ended up on my backside, slidding at lightning speed to the bottom of the ravine. There was absolutely nothing I could do to stop the momentum. The entire fall only took a few seconds, but it seemed like an eternity. Imagine sliding down a waterslide at your neighboring pool, but instead of landing in the water, your cushion is a bed of sharp, frozen rocks. Just like the moves of a great gymnast, I broke the last part of my fall by sliding on my stomach and dismounted into a full somersault, grazing my nose and forehead in the process before landing in a fully seated position. 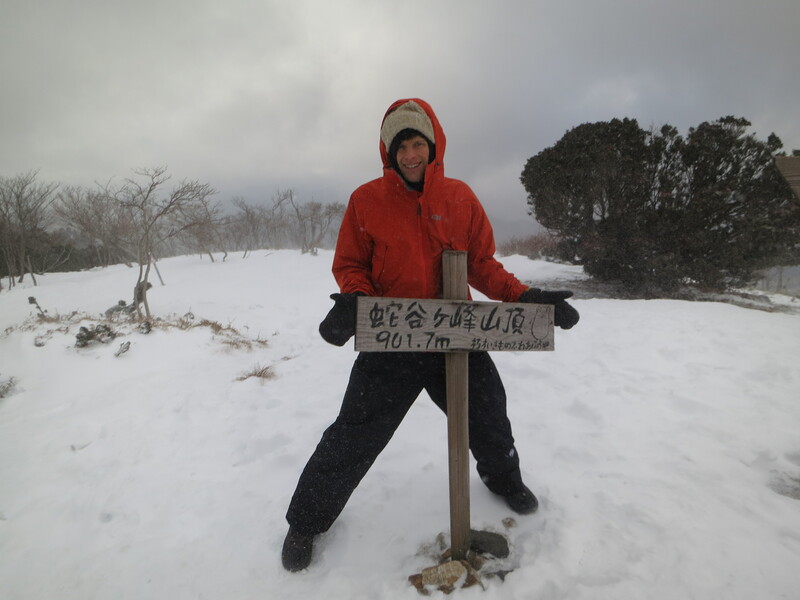 On the third day of the Year of the Snake, Ted Taylor and I headed to the western shores of Lake Biwa for an afternoon ascent of Mt. Jyatani-ga-mine, a name which translates as The Peak of the Snake Valley. As fate would have it, this mountain would push our physical and emotional boundaries, as well as put our very survival skills to an unexpected test. 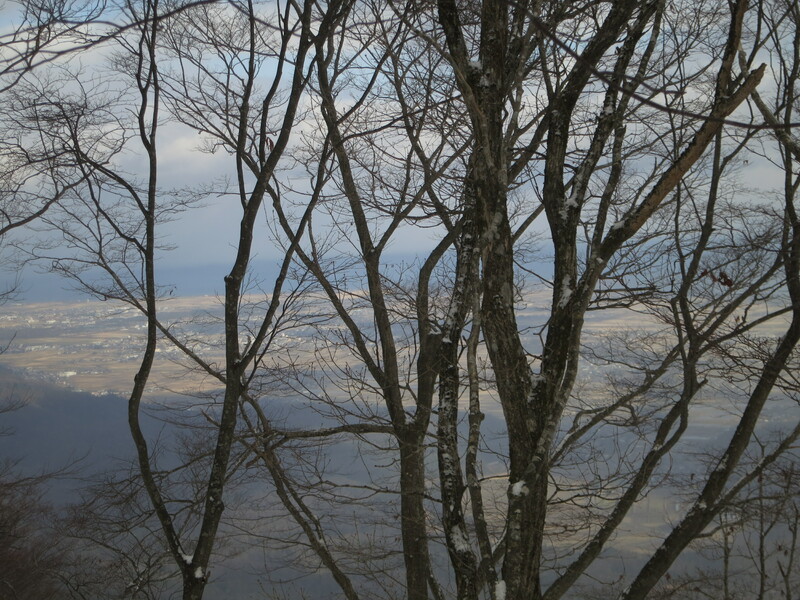 After cruising north on route 161 past the western shores of Japan’s largest lake, we pointed the car west, towards the quaint village of Hata, located in a steep valley between Buna-ga-take and our target peak. Directly above, the sun shone brightly through the soft stratus clouds, but just a few kilometers north, the peaks of the Makino highlands lay thick in a wall of arctic cloud and blustery white. The snow front was inching its way south, but we were safe for the time being. Arriving shortly after the lunchtime sirens reverberated throughout the hamlet, Ted and I sorted through gear while examining the bare-bones map showing two roads that led towards the mountain passes on the ridge. Scanning the horizon, we could both clearly see where the trail would follow the ridge. “Perhaps we can descend via that slope”, pointed Ted. We knew that even if we didn’t make the summit we could still do a bit of a loop hike for good measure. Unfortunately my guidebook didn’t cover our approach to the peak, as the hot springs and ski resort on the other side make it a far more palpable proposition for the cool winter months. Regardless, we had a general idea which direction we needed to go. The rice fields soon gave way to cedar forest, which led to a large, paved forest road lined with a 3-meter high chain-lined fence topped with electric wire. Surely this was built to keep more than just wild boar out of the village. 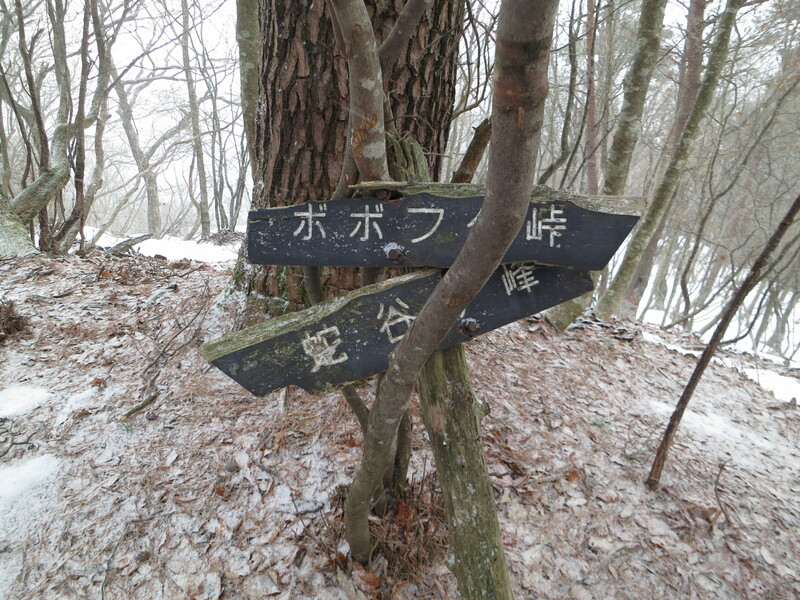 Crossing the deserted pavement, a signpost pointed the way to Bobofuda-touge, the crossroads for the ridge walk to snake valley. Pushing through the dense forest, the human footprints we chased soon crisscrossed with those of the antler variety before yielding to those elusive ursine creatures that still haunt the hidden folds of the Hira mountains. Here we were confronting two of Ted’s greatest fears head-on: snakes and bears. “Clearly these prints are not fresh”, hawked my companion. Reassurance was definitely something we both needed. The winds picked up considerably when reaching the exposed mountain pass. This weather front was moving in much quicker than expected, but we pushed on through the rolling clouds and fluttering flurries. Ted and I had reached the junction precisely one hour after leaving the car, but both of us knew that time management was of the essence. Setting a turn-around time of 2pm, we followed one solo set of prints, most likely laid by a local villager sometime after the last snow storm. Perhaps it was an early morning ascent to embrace the first rays of 2013, I quietly pondered. 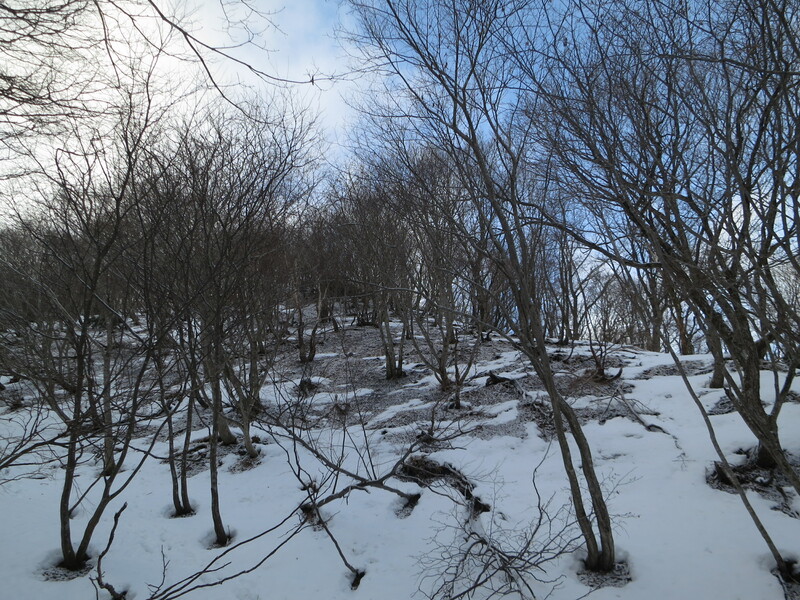 The ridge rolled north, dropping to a small saddle before starting the long, relentless climb towards the grassy knob of Jyatani’s curvy perch. “What’s our elevation?”, I yelled back to Ted. “Just over 700 meters”, came the reply, a barely decipherable tone through the howling winds. I took the lead, searching through the silvery haze for the red tape marks affixed to the bare deciduous trees. Moving as if on a C.I.A. mission, I topped out on a false summit, collapsing beneath a cedar tree while waiting for my partner to catch up. Rummaging through my gear, I pulled out the snow pants, knowing the slope I had just conquered would be perfect for a late afternoon glissade. “The good news is we’re almost there”, I announced, “but it’s 2pm now”. Ted and I knew we should turn around but silently agreed that it would be a huge waste to head back now. Once again, I played the part of guide, kick-stepping a path through the knee-deep snow drifts to the desolate summit. There was no one in sight for miles and miles. Well, at least no one sight for meters and meters in the thick white murk. 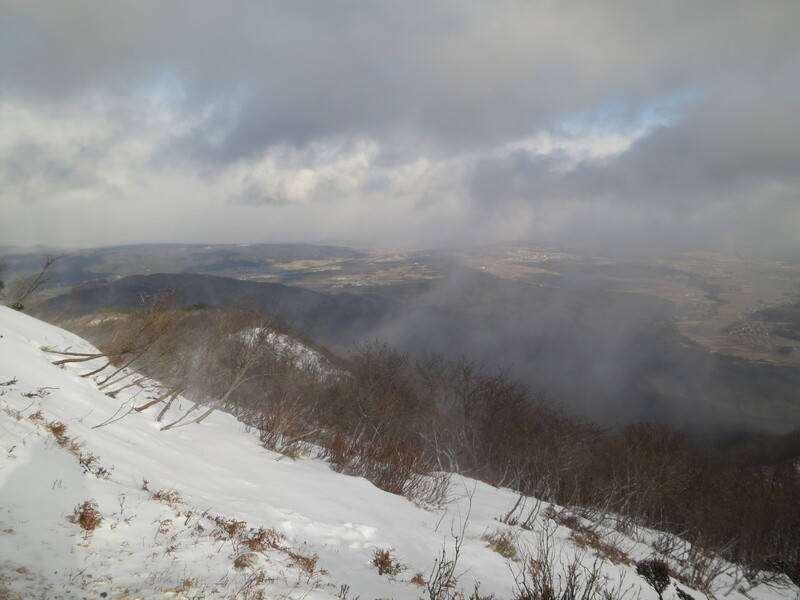 As Ted approached the high point, however, the clouds mysteriously started to break up, revealing views down to the surrounding plains and valleys. By the time we started backtracking the sun had made an unexpected appearance. Once back at the false summit, we let our rear ends do the navigating, sliding smoothly to the saddle before crossing a small stream and meeting back up with the main trail. Our shortcut had easily cut 30 minutes off our return, and both of us skated along the ridge in high spirits, dreaming of the warm noodles and hot bath that awaited us upon our return. 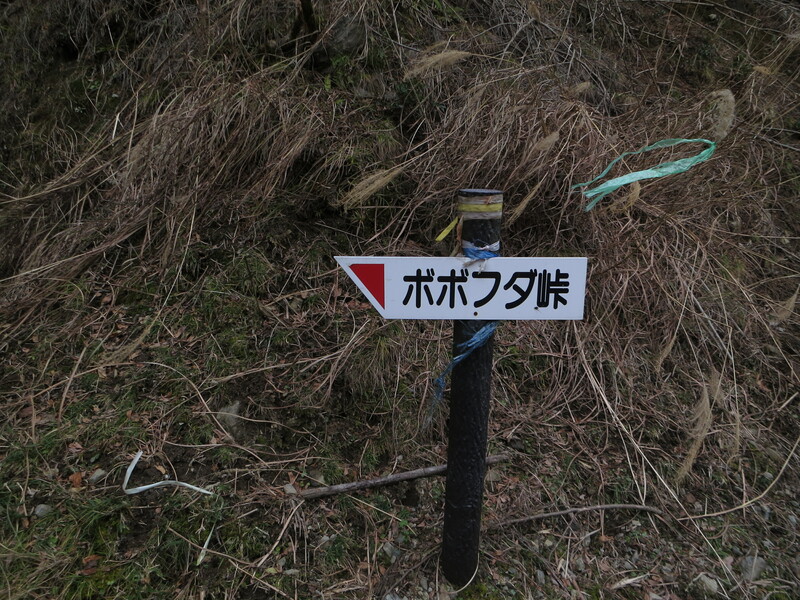 We reached one final, rotting signpost that indicated only 500 horizontal meters between us and Bobofuda-touge. 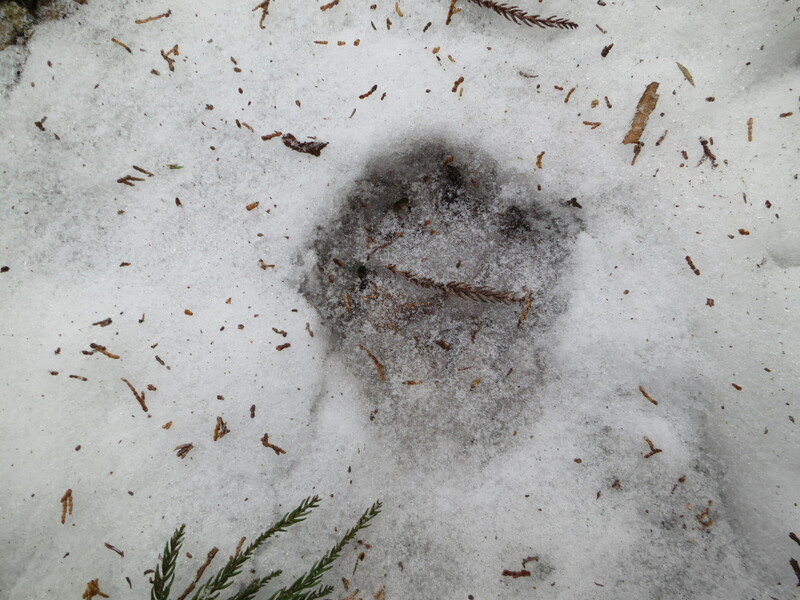 Both of us continued following our prints as they led away from the ridge down towards a stream. By the time we reached the water Ted and I had realized that we were following animal tracks and had veered off the trail. “No problem”, we both exclaimed, “I’m sure we can just continuing follow d0wnstream, as it should meet up with the main trail soon.” Little did we know that our true adventure was just about to begin.